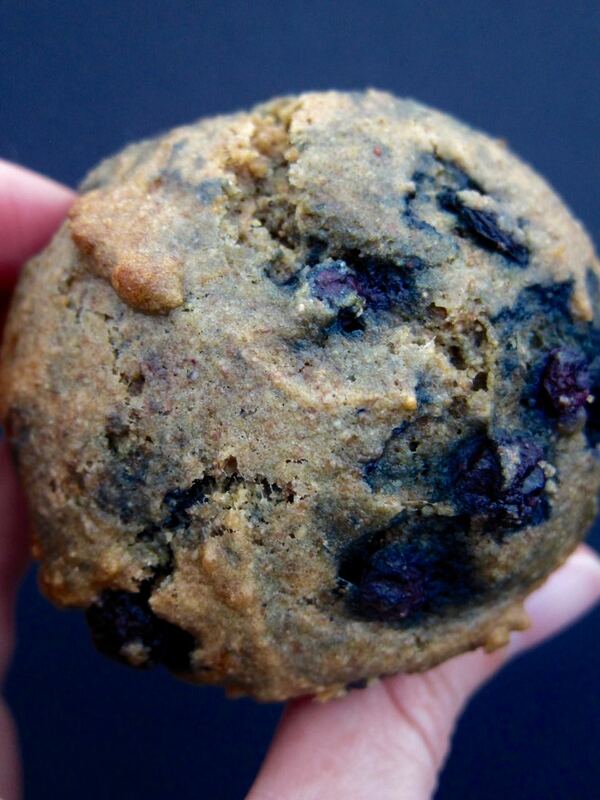 At one point does a muffin become a cupcake in yoga pants? That is the question I began to ponder as I tested these muffins again and again, trying to make the blueberry lemon spelt muffin of my dreams. The only problem is that spelt, unlike refined white flour, has a stronger flavor that overpowers the delicate baked flavor of lemon zest. No matter how much zest I rubbed into my sugar or lemon juice I added to the batter, I couldn't taste the lemon at all. I considered lemon extract, but I really didn't want to go that route. I thought about a lemon syrup or glaze, and it was at that point that I realized I was crossing the border to cupcake land. So, I switched to ginger! The stronger flavor can hold its own against the spelt flour, and pairs wonderfully with the blueberries. Even better, the ginger kept these on the muffin side of the spectrum, towards the healthier end. Plus, the spelt has such great, naturally buttery flavor that you don't even really need butter on these (but you still could, photo evidence above). I consider all of this to be awesome news, considering I ate the leftover bag of "experiments" sitting in my freezer for breakfast everyday last week (insert emoji shrug lady here). Heat oven to 325 degrees. Prepare a muffin tin or silicon baking cups. Mix all dry ingredients together in a large bowl, then mix in the liquids and whisk or stir until smooth. You may need to add a little more milk if mixture seems dry. Stir in blueberries and crystalized ginger, if using. Fill muffin cups 2/3 full and bake for 15 minutes, then rotate pans and bake 7 minutes more. Cool in muffin cups for 5 minutes then flip muffins and continue cooling. Serve warm or room temperature.